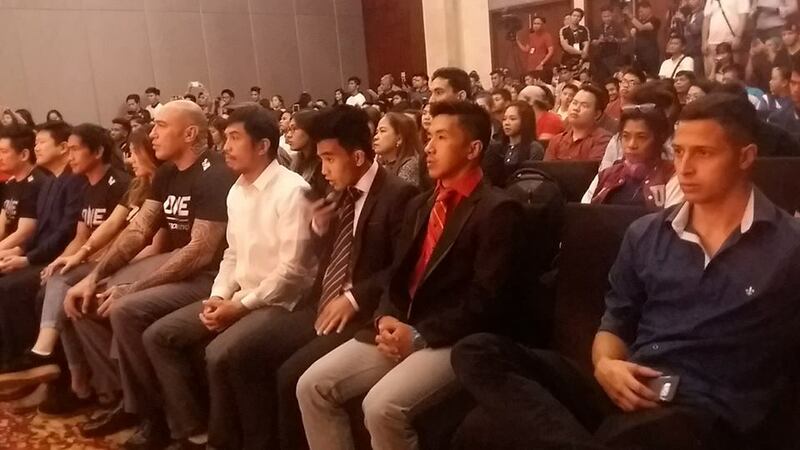 The largest global sports media property in Asian history, ONE Championship™ (ONE), recently held the ONE: GLOBAL SUPERHEROES Official Kick-Off Press Conference last January 22, 2018 at the Manila Grand Ballroom of the City of Dreams. Main event competitors Geje Eustaquio the Philippines and Kairat Akhmetov of Kazakhstan faced-off for media in attendance. 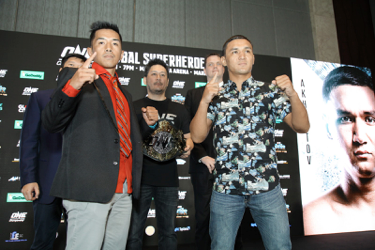 They will be competing for the ONE Interim Flyweight World Championship in the headline bout of ONE: GLOBAL SUPERHEROES which takes place Friday night, 26 January at the Mall of Asia Arena in Manila. Also in attendance at the ONE: GLOBAL SUPERHEROES Official Kick-Off Press Conference were Chairman and CEO of ONE Championship, Chatri Sityodtong, Co-Founder and Managing Director of Global Citizen, Wei Soo, Vice President for Gaming Operations of City of Dreams Manila, Kevin Benning, co-main event competitors Joshua Pacio and Lan Ming Qiang, as well as Filipino martial arts veteran Eric Kelly and his opponent, Rafael Nunes. Top flyweight contender and former world title challenger Geje “Gravity” Eustaquio of Baguio City, Philippines, is one of the most skilled martial artists in Asia, and a highly-decorated wushu practitioner. His solid striking and grappling skill set has led to huge victories over the course of a seven-year professional career. Training in the high altitudes of the Philippines’ Summer capital, Eustaquio hones his craft alongside world-class teammates at the fabled Team Lakay. Known for his incredible ability to keep calm in the face of adversity, Eustaquio is set to headline ONE: GLOBAL SUPERHEROES opposite Kairat Akhmetov for the ONE Interim Flyweight World Championship. Former ONE Flyweight World Champion Kairat Akhmetov is a veteran martial artist from Almaty, Kazakhstan. The 30-year-old boasts a solid 24-1 professional record amassed during a stellar martial arts career which has seen him dominate his opponents with tenacious wrestling and powerful striking. In his most recent appearance inside the ONE Championship cage, Akhmetov defeated Geje Eustaquio via closely-contested three-round split decision. Now he faces Eustaquio in a rematch, this time for the ONE Interim Flyweight World Championship. ONE Championship is the largest global sports media property in Asian history. Headquartered in Singapore, ONE Championship is the home of martial arts. The world’s most exciting martial arts organization hosts the largest sports entertainment events across Asia, featuring some of the world's best martial artists and world champions, all signed to exclusive contracts, on the largest media broadcast in Asia. Do visit www.onefc.com, follow @ONEChampionship on Twitter and Instagram for more updates on ONE Championship.